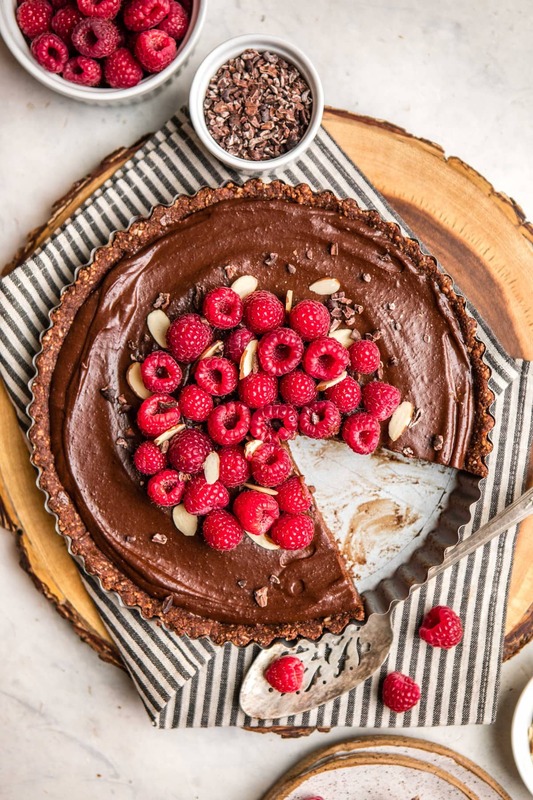 You’ll hardly believe that this decadent No-Bake Chocolate Raspberry Tart is made with only 8 healthy ingredients! Vegan, Sugar-Free, & Grain-Free. 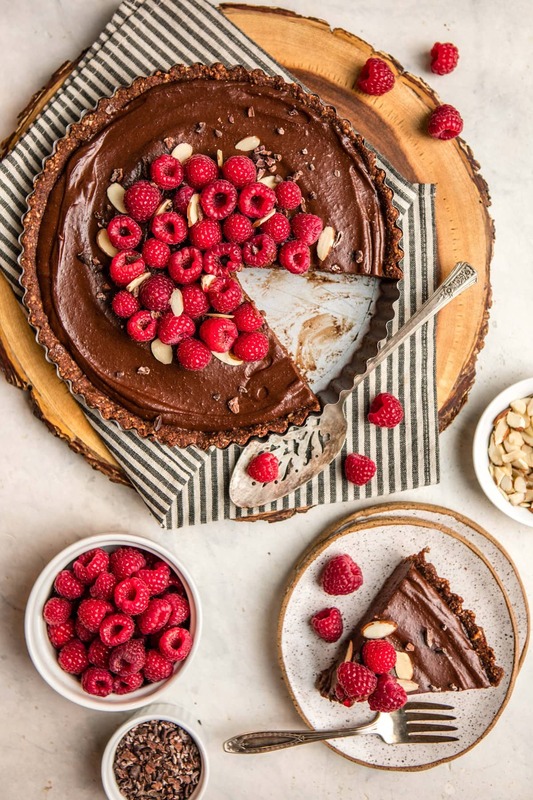 Not only is this Chocolate Raspberry Tart No-Bake, Vegan, and Grain-Free, but it’s also made with only 8 healthy ingredients and takes less than 30 minutes to make! It all starts with an easy 3-ingredient crust made from Almonds, Cacao Powder, and Medjool Dates. Add everything to a Food Processor or blender, pulse to form a sticky “dough,” and then press into a tart pan or pie tin. While that sets in the fridge, we’ll make our easy, silky, oh-so-amazing Chocolate “Mousse” filling. The best part? You only need some Silken Tofu, Almond Butter, melted Chocolate, and Vanilla Extract to make it! The Almond Butter and Chocolate combine to make a rich and creamy filling, and the Silken Tofu (which you cannnot taste at all – promise!) helps to make things mousse-like and fluffy. Place the tart in the fridge to let everything set, then top with fresh Raspberries and serve cold! 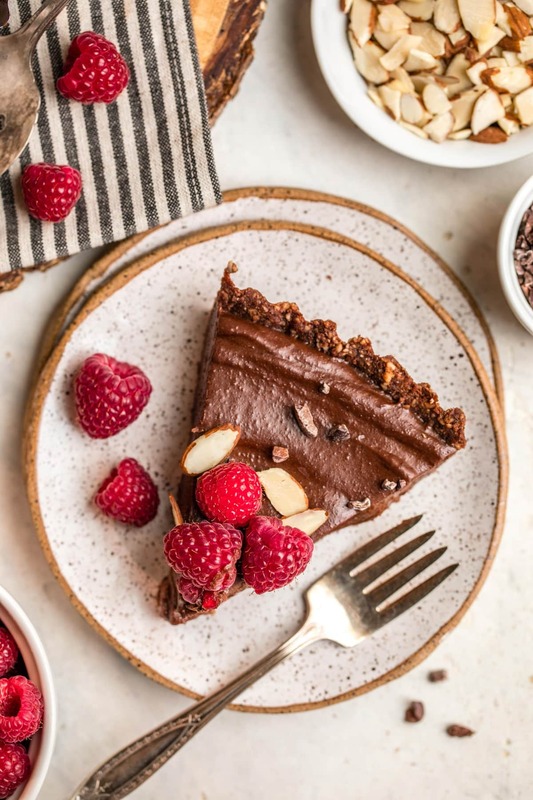 I decided to add some Slivered Almonds and Cacao Nibs to mine for some extra pizzazz, but that’s totally optional 😉 If you’re bringing this to a party or gathering, you can easily make the Tart a day in advance and keep it in the fridge until you’re ready to top and serve. 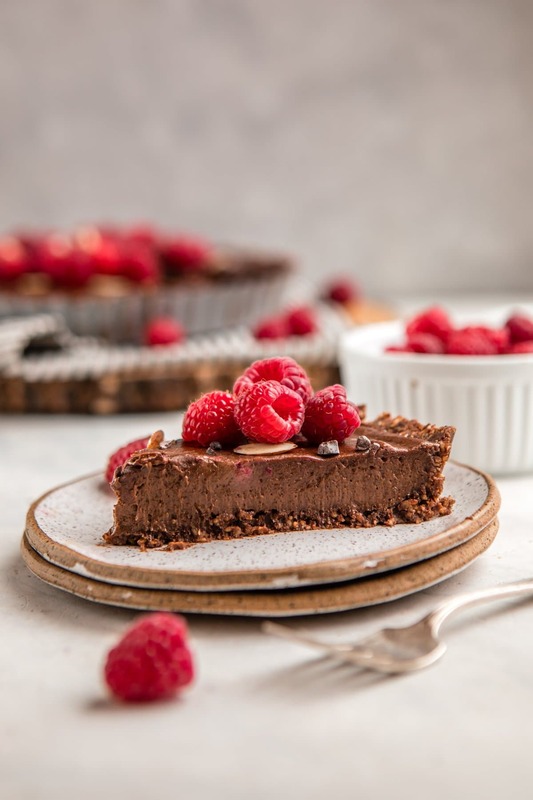 This No-Bake Chocolate Tart is just as satisfying and delicious as it’s non-vegan version – I bet people won’t even know it’s vegan! It’s definitely rich and creamy, so a little goes a long way. 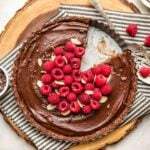 The Raspberries help to balance the rich Chocolate flavor, but I also like to serve mine with a glass of Non-Dairy Milk too. If you opt to use a tart pan for this recipe, I suggest lightly greasing the pan with nonstick cooking spray or oil. Otherwise, the tart will be very difficult to remove! You can also make it in a pie dish, slice, and scoop it out as-is. You can substitute the Almond Butter and Almonds with another Nut Butter and Nut/Seed, but this will affect the final flavor – see the recipe notes for my suggestions! If you’re looking for more Chocolate Dessert recipes, you’ll also love these Fudgy Peanut Butter Brownies and these No-Bake Chocolate Turtle Cookies! First, prepare the crust. Add the Raw Almonds to a Food Processor or High-Speed Blender and pulse until a coarse meal forms. Then add the Medjool Dates, Cacao Powder, and Salt – pulse until well-combined. Pour in 1-2 tbsp of Filtered Water to help the “dough” stick together more, if necessary. Transfer the pie crust to a greased or lined pie or tart pan and press it evenly around the edges. Place it in the fridge to allow the crust to set while you prepare the filling. Add the Silken Tofu, Almond Butter, Vanilla Extract, and Salt to the same Food Processor (no need to rinse!). Process until the Tofu has broken down and a smooth, uniform “batter” forms. Melt the Chocolate using either the microwave or a double boiler, then pour it into the Tofu mixture. Blend together until everything is evenly incorporated – the mixture will be thick, and you may need to scrape the sides of your appliance with a spatula. 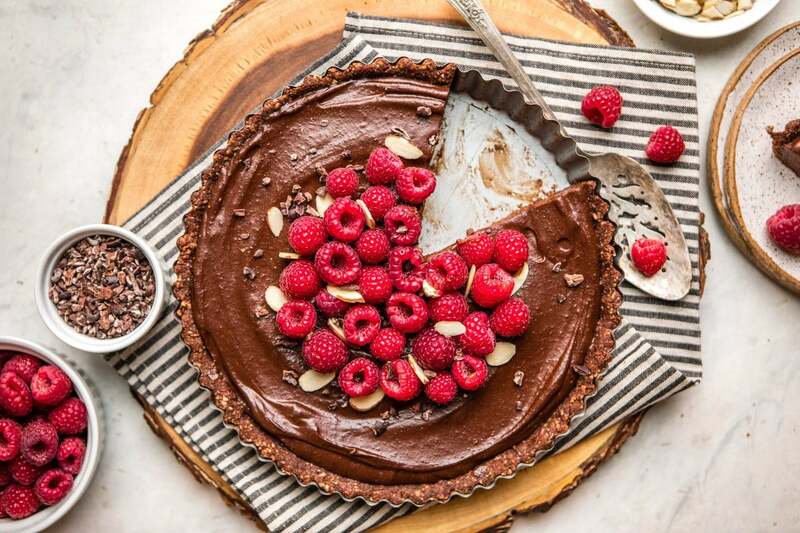 Transfer the Chocolate filling into the tart pan, and use a spatula to spread it around evenly. 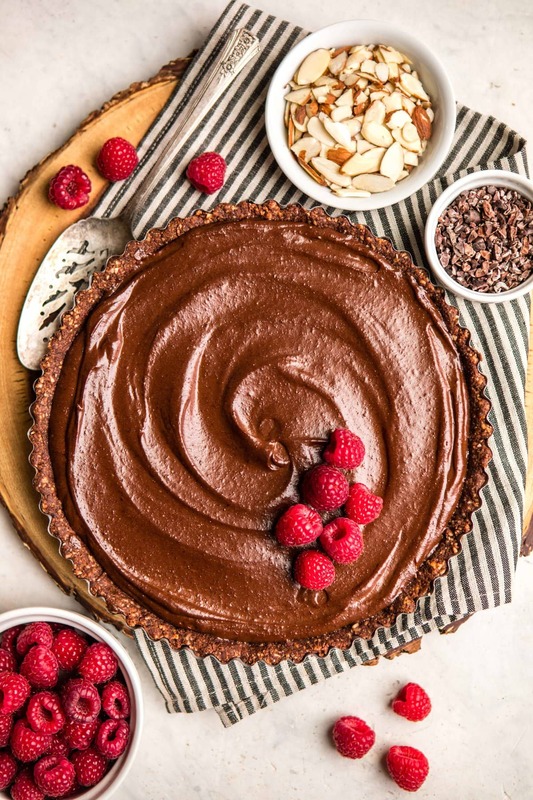 Place the tart into the fridge for another 20-30 minutes, to allow the Chocolate to set. The filling will be firm to the touch once it is ready. Remove from the fridge and top with Raspberries and any other toppings that you’d like. Slice, serve, and enjoy! Store any leftovers in the fridge for up to one week. I have not tested this recipe using any other nut besides Almonds, but I imagine that a harder nut such as Walnuts, Pecans, or even Hazelnuts would work well here. Almond Butter may be replaced with any other Nut or Seed Butter of choice. If your Butter has Salt in it, add 1/4 tsp to the filling instead of 1/2 tsp. Make sure your Medjool Dates are nice and soft; if they are not, soak them in hot water for a few minutes, then drain thoroughly and use according to the recipe instructions. Hi! I love your blog and have made a couple recipes so far (loved every single one). I would love to make this tart for Valentine’s Day but I don’t know the oz measurements. How much would 8 oz of chocolate and 12.3 oz of tofu be? I assumed from the video 2 bars and a whole package respectively but I want to be sure. And also, did you use sweet chocolate and this is why you don’t use other sweetener? Just wondered if there is something that the tofu could be substituted with ? This dessert looks beautiful and love you blog and videos! I’ve been vegan for about 1.5 years, and I’ve always had trouble liking tofu. Extra firm tofu was what I always grabbed, and the texture just doesn’t vibe with me. I prefer whole beans and other protein sources. But when I tried this recipe with the silken tofu….Oh. My. Word. It was DEVINE! Now i’m exploring new ways to use silken tofu, especially the firm silken tofu for breakfast scrambles! Thank you for opening my eyes to a world of tofu possibilities!! I subbed peanut butter for almond butter, and it tasted like a giant peanut butter cup. YUM!